We got the first glimpse of Centuro during the first ride of its sibling Pantero back in early January 2013. 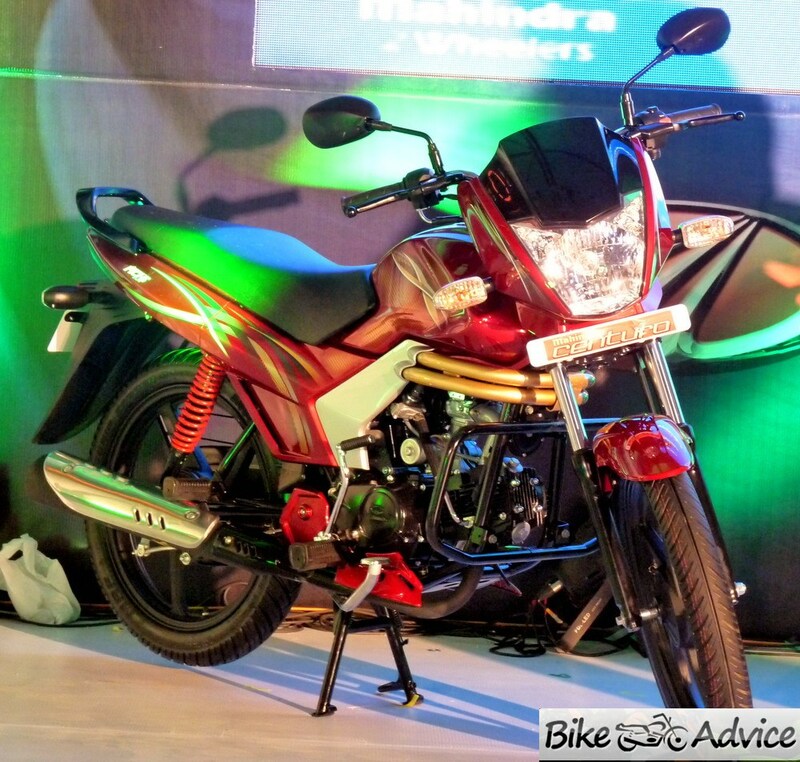 Mahindra promised to launch the bike soon and it seems the Pune based auto maker is all set to let their premium 110cc out on the roads. Of what we have come to know, the company is planning to launch the bike in the market very soon, probably within a span of a few weeks. Centuro is a more muscular version of Pantero and comes with more bells and whistles to lure a generic buyer. It is powered by a 106.7cc 4-stroke MCI-5 engine which is built in-house by Mahindra. Centuro produces 8.5PS of peak power output at 7500 rpm and 8.5Nm of maximum torque at 5500rpm. Mahindra’s strategy is to place the Pantero at the lower end of the entry level 100-110cc segment whereas this Centuro will be a more premium offering directly in competition with Passion, Dream Yuga, Discover 100T etc. Centuro weighs only 111 kilograms despite all that visual flab and Mojo-inspired chest tubes. Centuro comes with some really useful and innovative features like Engine immobilizer, Find Me Lamps, Guide Lamps, Full-Digital Console, Remote 28-bit encrypted Flip key, Central Locking Anti Theft System among others. Centuro also has a lower saddle height than Pantero and comes with a higher ground clearance. And through our sources, we have also come to know that Mahindra has also worked on the engine as well. Though, it will carry the same specifications, Centuro will have lesser vibrations and will boast of better driveability. Pricing would be the key for Centuro. Along with the striking features Centuro is offered with, if Mahindra can price the bike competitively, they might have the first true hit in the motorcycle segment.